In the old barber’s shop Gardel is singing. Summer has arrived in Maroñas and all seems peaceful. Yet, suddenly, someone escapes from a paragraph and appears a moment later in London. 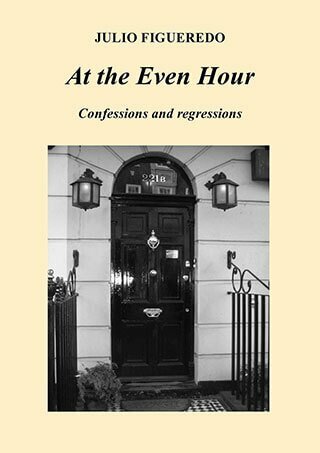 At 221b Baker Street, Sherlock Holmes listens, absorbed by the confession of his visitor. In At the Even Hour words are tiny shards of a mirror; which when read reflect back to us. That is why, when Tito tosses his brush into the air, we are not surprised to see a Montevideo of the past, and that the Angenscheidt department store is open and a young man, dangling from a stairway, is starting to dress the shop windows and dream of far-off places. In these mirror-paragraphs there are surprises at every turn: a knife fight in a frontier town; a beautiful woman, an expert in cabbala, escaping across Hampstead Heath; a man’s desperate flight in the darkness of a graveyard; the thrill of a head-to-head at the Maroñas racecourse. And Rick Blaine, saying goodbye to Ilsa Lund in that hangar in Casablanca . . . Anything can happen in this book by Julio Figueredo, an entrepreneur-author, who from Camden Town and, sometimes, from his Uruguayan refuge in Las Grutas, Punta Ballena, has prepared this feast of intimate stories with the patience of a great chef. The time has come to knock on the legendary door of the most famous detective in the world. This very night. At the even hour. Julio Figueredo was born in Montevideo, Uruguay, in 1944. He was a window dresser at the Angenscheidt department store, a money broker in La Ciudad Vieja, a basketball player for Club Goes, a lover of the arts and a supporter of the Lista 99. In 1967 he emigrated to Europe and became a citizen of the world. He has lived in many countries, working in all manner of trades. He was a model and acted in film and television. In London he married Karen Doherty, with whom he founded the now legendary restaurant, The Camden Brasserie. He currently lives in Punta Ballena, Uruguay, and Camden Town. He has always written. At the Even Hour is his first book.